This Blog is built - not, as some might expect, on a flimsy whim but on a strong and single minded principle. That principle concerns Biscuits and their position in the world. We are really very keen on biscuits. As are many of you out there. We wish to create an archive of Arrowroot, a backlog of Bourbons and a catalogue of Chocolate Fingers. Anybody can contribute an entry - or dispute somebody else's - provided they are not dull. Even Americans who perhaps don't really have the heritage of biscuitry that we are fortunate to have here. Or maybe they do and we are unaware of the full glory of the cookie. We realise that this whole subject is admirably and concisely dealt with by that excellent and unbeatable website A Nice Cup of Tea and a Sit Down. Our feeble efforts will be as the kicking of a gadfly in the face of their wisdom and experience but we hope that we may have a small contribution to make. He does sterling work growing many inappropriate plants in Devon. He dedicates a great deal of time and effort nurturing a plethora of plants that are (mostly) totally unsuited to our climate. His is a life of such extreme eccentric dedication that to start a Blog about Biscuits seems perfectly normal. He treads gently in the footsteps of people like the great William Buckland,a professor of Geology who claimed that he could tell location by tasting the local topsoil. This post has been (legally) filched from the excellent Blog of Esther Walker, Recipe Rifle to whom we extend an almost indecent gratitude as we are running out of stuff to post. You the readers are our lifeline and you are fraying somewhat. Look, we are reduced to thievery in order to survive…..you will miss us when we’re gone. All posts and suggestions welcome: now, over to Esther…..
Another Jamie Oliver recipe. The dough quantity here makes loads of biscuits – at least 30 depending on how big your biscuit cutters are. I decorated these using Dr Oetker’s writing icing*, available from Waitrose, but any writing icing, sprinkles, or silver ball decorations will do. 1 Preheat oven to 190C or 180 for fan ovens. 2 Mix together the first 6 dry ingredients. I recently learnt that swizzling dry ingredients with a whisk does pretty much the same job as sieving. 3 Rub in the butter with your fingertips until the mixture is crumby then add the egg and the syrup and mix with a spoon – not a fork or a whisk or it’ll all get stuck between the spikes and drive you mental. 4 You ought to have a fairly soft dough by now, depending on how accurately you manage to measure out your syrup. Too much syrup – very easily done – and you’ll have to compensate with a bit more flour. This dough at the best of times is quite soft and fragile. It breaks away and flops out of shape quite easily – so don’t lose heart if you only manage to get 2 out of every 3 dough-shapes safely onto your baking tray. A useful tool to have at hand is a fish slice or any other slim, flat metallic thing to slide your shapes off the worktop. This dough rises a bit, so best to roll it out quite thin – about 2-3mm. 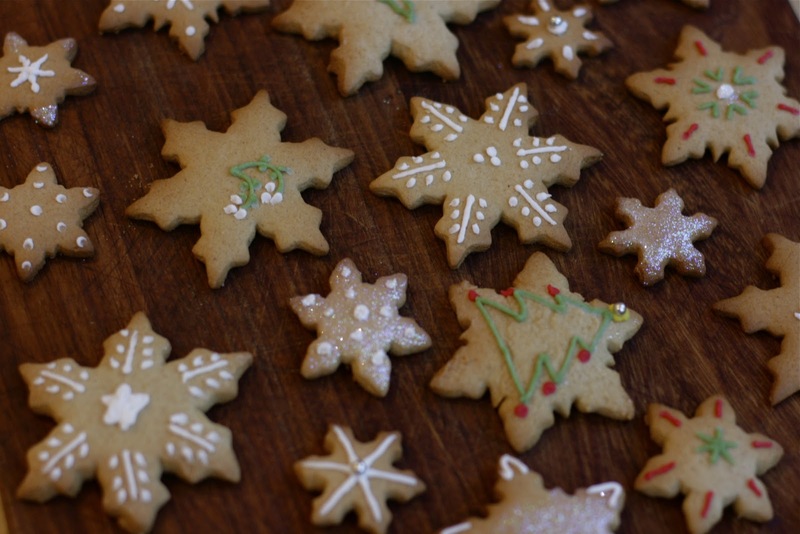 If you want to use these as tree decorations, poke a hole in the top before baking. 5 These biscuits are incredibly sensitive to individual oven strengths. Mine has a fan and is brand new and is a very unsubtle creature – she is the BA Baracus of ovens – and so I only needed to do these biscuits for 5 mins at 180C. Your oven will be different. So my advice is to start off by baking one or two biscuits at 190 for 10 minutes and take it from there. What you’re looking for is a nice golden colour but a still a fraction of give in the middle of the biscuit. When they come out of the oven, they will still be squidgy and will harden on cooling, so wait 5 mins before testing their done-ness. A note: Babies seem to go completely nuts for these, especially those teething. It’s the ginger or something – and the fact that if you drool a lot over them they turn into a sort of cakey consistency. If you wanted to do them especially for a baby, you could halve the quantity of sugar, (or cut it out completely depending on how sensitive you are about that sort of thing), and then cut them out quite thick, like a rusk. * if I might interject briefly: Dr Oetker holds a mythic position in my life. He is the inventor of Dr Oetker’s Ice Cream Pulfer which was a sort of dehydrated ice cream which we ate as children. I remember it being ambrosial but I am pretty sure that, in reality it tasted like the sludge at the bottom of a goldfish bowl. We are looking for your personal biscuit experiences: the story behind the crunchy topping. Perhaps a long forgotten favourite. A regular without which you would feel bereft. A luxury for special days. A bit of biscuity history. Or something that sets your teeth on edge. Hopefully there will be a Daily Post (except Sundays when the Governing Plenum will be in their Dachas). Once you have chipped in then you may also invite contributions from far and wide. It is like a cross between a chain letter and a rather seedy members-only club. Links to all contributors will appear here.